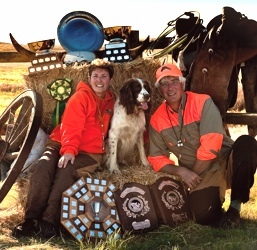 Peter Loucks has been involved in spaniel field trials for over 30 years. 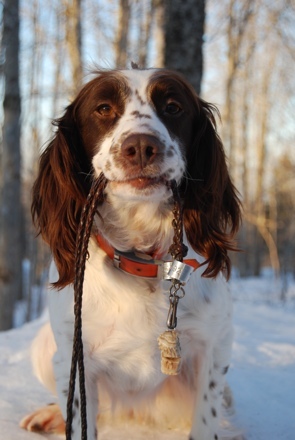 He has trialled spaniels in the past, and now is a key member of the Nova Scotia gun team on the east coast of Canada. Peter's hobby is making dog whistles from deer antlers. Each of Peter's whistles is a work of art. 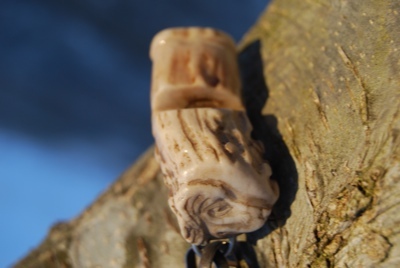 Some are intricately carved with dogs or wildlife. The whistles have a unique shape, colour, size, feel and sound. Field trial handlers are very particular about their whistle. When purchasing a whistle from Peter, he doesn't just give them one or two to try. Instead, he hands over a bag containing dozens. Which one should be chosen? 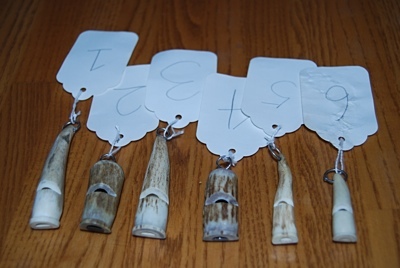 It is common to see a competitor before a field trial trying out each whistle in the bag, one by one. Picking the perfect whistle is a serious matter for a dog handler! Such an important decision cannot be rushed. As a university professor and avid competitor, I wondered if science could help pick the perfect whistle. I enlisted the help of an acoustical engineer and a student to help with the project. Our test subject is Amie, a four-year old, female, field trial spaniel. We borrowed six whistles from Peter. The whistles were chosen based on their distinctive sounds to our ears. To evaluate the whistles, we measured their acoustic properties and how a spaniel responded to them. The first property measured was frequency. When blown, each whistle emitted a unique dominant frequency. The frequencies measured were 4,360Hz, 4,680Hz, 4,800Hz, 5,200Hz, 5,880Hz, and 7,300Hz. To the human ear, the low frequency whistles sounded loud, and the highest frequency whistle sounded high pitched and soft. All the whistles are in the audible range for both humans and dogs. The approximate hearing range for a human is 20-20,000Hz. For dogs, it is estimated to be 65-45,000Hz. It is important to note that the whistles all fall within the range 3,000-12,000Hz in which dogs are considerably more sensitive than humans to these sounds. It is also important to mention that human hearing peaks around 2,000Hz. A dog’s sweet spot for hearing is estimated to be at 8,000Hz. Since we are trying to find the best whistle from the dog’s point of view, our initial hypothesis was that the high frequency whistles would be optimal. For example, the 7,300Hz whistle is very near the 8,000Hz canine sweet spot. Although this whistle sounded the softest for us, we assumed it would be the clearest and most easily heard for the dog. The second property measured was loudness. A whistle's loudness depends very much on the environment. For example, the perceived outdoor loudness is dependent on atmospheric and wind conditions. We therefore require a location independent measure of loudness, which is called sound power. Sound power is a measure of the whistle's sound energy. In all tests, the distance at which the sound power was measured did not change. What we did vary with each whistle was the amount of air entering the whistle. To control this, each whistle was attached to a pressurized air tank via a flexible plastic tube. Measurements were taken at 10, 20, and 30 PSI. For most whistles, the sound power changed as the air pressure changed. The five whistles with the lowest frequency had the highest overall sound power when 30 PSI was blown into them. Their sound power did not vary considerably. The lowest frequency whistle also had the lowest sound power. Unlike the other whistles, it achieved a maximum sound power at 20 PSI and a minimum at 30 PSI (i.e., over-blowing in a whistle does not necessarily increase its sound). The final experiment we performed was to measure how a spaniel responded to each whistle. The location chosen for this experiment was a flat, straight gravel road in the countryside. The bordering large flat fields contained either pastures or cut grain. There were no obstacles to obstruct or bounce sound waves. The spaniel was hupped in the middle of the road and the student stood beside her. The student ensured the dog remained hupped until the experiment could begin. The dog's owner would be at a pre-set location on the road and blow the draw whistle. No hand or other physical signals were given. We would record that the dog heard the whistle if it responded immediately to the draw whistle. We also recorded whether or not the student heard the whistle. We varied the distance between dog and owner, used every whistle, and repeated the experiment on different days. On the first day we performed the experiment it was cold, sunny, and there was no wind (i.e., perfect conditions). The maximum distance between handler and dog was 550 yards. At that distance, the handler could not see the dog when it was sitting motionless. The dog heard every whistle except for the one with the highest frequency. The student heard the whistles with mid-range frequencies. He could not hear the highest or lowest frequency whistles. We were surprised that the student could hear any of the whistles at this distance. But, keep in mind that he is young and has not been exposed to years of shotgun blasts. We did not experiment with further distances. If your dog is ever 550 yards away at a trial, it is time to walk over to it with a lead and pick it up; there is no point in using the whistle! We waited for a less optimal day to repeat the experiment. The next time afield, it was overcast with a strong cross wind. Once again, the dog responded to the five lowest frequency whistles at the greatest distances. But, the maximum distances were considerably less, between 300 and 355 yards. The only whistles the dog could hear at 355 yards were the two with the lowest frequencies. The whistle with the highest frequency could not be heard at 275 yards. The student could hear all the whistles at the same distance as the dog except for the 5,880Hz one. Overall, we ranked the 4,800Hz whistle to be the best. Clearly, the worst was the highest frequency whistle. As a rule of thumb, at least in the case of the deer horn whistles, what sounds loudest to the half-deaf handler probably also sounds best to the spaniel. We considered the experiments to be a success; they gave me a legitimate reason to bring a spaniel to the office! Andre Trudel lives in rural Nova Scotia, Canada with his wife, Cindy, two miniature dachshunds and ten English springer spaniels. They operate the Gaspereau Mountain Kennel and participate in spaniel field trials. To pay for the dog food, Andre is a computer science professor at Acadia University. One of his research interests is computer interfaces for dogs which was featured on CNN!